Tablature or Tab for short, is a system of notation for the guitar. This reference will focus on the type of tablature that is found on the Internet. While Internet tablature has many things in common with tabs found in magazines and books, there are many differences as well. Tablature for a standard 6 string guitar will consist of 6 lines, one for each string of the guitar. Some tablature will have 7 lines if a 7-string guitar is being used, or 4 or 5 lines for bass. But all of the examples in this reference will be for a standard 6 string guitar. The bottom line in tablature will represent the 6th string of the guitar. The 6th string is the thickest, lowest sounding, and closest to the ceiling if you are holding the guitar in playing position. The top line in tablature will represent the 1st string. This is the thinnest, highest sounding, and closest to the floor. This is how the guitar would look if you where holding it in your lap. The numbers in tablature represents the frets where you will place your left hand fingers. For example: 3 means the third fret. So you would press down the string just to the left of the 3rd fret bar. (See picture above) A 0 (zero) would mean that you play that string open (not pressing down the string with your left hand). Tablature is read from left to right. If you see something like the example below, just play the notes in the order that you see them. When you see 2 or more numbers stacked up on top of each other, you will play the notes at the same time. So in the example below you would play the 1st string...5th fret, and the 2nd string...5th fret at the same time. 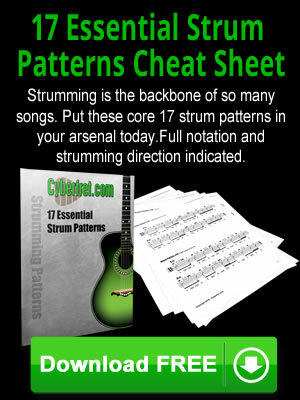 For more on this, see the "Chords in tab" section of this reference. Tablature does not indicate what finger you should use to play each note. You will have to make that decision on your own. But as a general guide, think about this. You have 4 fingers, use one finger per fret in a 4 fret area. So if you have something like the example below, use your 1st, 2nd, 3rd and 4th fingers. Keep in mind that this is a very general guideline, and not everything is as clear cut as the above example. Knowing these basics about tablature will help you get started playing a wealth of songs available on the Internet. But there are some more specific symbols that you need to be aware of when on your guitar tablature journey. One thing to keep in mind, is that this system of notation is far from being standardized. I will try to show you the most common symbols used, but the person who wrote a particular piece of tablature sometimes uses their own non standard symbols. They might even use the wrong name for a particular technique, which can be very confusing. Get a recording of what ever song you are working on, and use your ear along with the tab to help.